In the previous post, we have seen how to install the veritas volume manager on linux. In this post, we will discuss about the below topics of Veritas Volume Manager(VxVM) which is installed on RHEL7. 5. 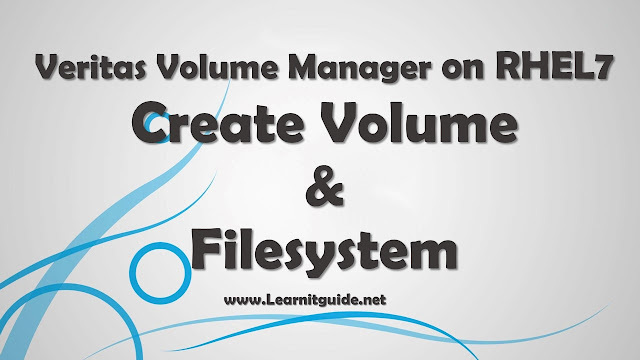 How to create a Filesystem on the volume. 1. Storage Foundation Basic 6.2 (Linux) tool - Downloaded from Symantec.com which includes Veritas Volume Manager(VxVM) packages. Ensure the disk is detected and not mounted using fdisk and df -h command. Execute the below command to list the available disk under Veritas Volume Manager. Veritas volume manager, because these disks are not initialized by Veritas Volume Manager(VxVM). Lets see how to initialize the disks. Some time you may get an device column output in "Enclosure based names", for example. so just change the naming conversion format to "Operating System Based names" which will help us to identify the correct disk. To change the "Enclosure based names" to "Operating System Based names"
To revert back to "Enclosure based names"
Once you have identified the correct disks, goahead to initialize the disks using vxdisksetup command. For example, lets take sdb and sdc disks. Verify the disks are got initialized or not using vxdisk command. Disks status which shows as "Online" are initialized and it belongs to VxVM. Diskgroups are same like Volumegroups in LVM. So create a example disk group "testdg" and add the identified disks to the "testdg" diskgroup. Check the disk group properties. lets assume that I have new disk "sdd" and same needed to be add to the exisitng diskgroup "testdg". So How to add a new disk into exisiting Diskgroup. Initialize and add the disk as below. Lets create a Volume of 100MB within the diskgroup. Note: If you get an error when you use "vxlist" command as below. VxVM DCLI vxlist ERROR V-50-49971-158 Authentication or communication could not be established with the server. Where "/dev/vx/rdsk/testdg/vol1" is the device file for volume vol1. Verify the mounted file system using mount and df command. Refer the link to know how to resize the Vertias Volumes Online.